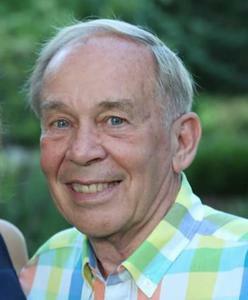 Roger John Mulder, 75, passed away Wednesday, December 20, 2017 surrounded by his family at Spectrum Hospital in Grand Rapids due to complications from a fall. Roger is a graduate of Hope College and Western Seminary. Following retirement, he worked in maintenance at Camp Geneva for 16 years. He had a passion for people and his coffee shop ministry. He also enjoyed spending time with his wife, daughters, grandchildren, and great grandchildren. He is survived by his wife of 55 years, Judy (Grotenhuis) Mulder; children Sheryl and Mike Boes, Dawn and Jim Van Kampen, and Carla and Jim Bos, all of Holland; grandchildren Angela and Paul Brown, Allison and Benjamin Attema, Lindsay and Grant Geurink, Kelsey and Chris Bloom, Paige Van Kampen, Mallory Boes, and Amanda Bos; great grandchildren Noah and Ehren Brown, and Riley Bloom; brother Delwyn (Jean) Mulder of Queensbury, NY; sister Mary (Gilbert) Gutierrez of Holland; brother-in-law Roger (Joanne) Grotenhuis of Grand Rapids; sisters-in law Karen (John) Meiste of Holland, and Fern (David) Slotman of Allegan; and several nieces, nephews, and cousins. Roger is preceded in death by sister Marcia Lang and granddaughter Erin Van Kampen. Visitations will be 1-3pm and 6-8pm at Dykstra Mulder Chapel (188 West 32nd Street) Tuesday, Dec. 26th. The funeral service will be 11am on Wednesday, Dec. 27th at Trinity Church (712 Apple Avenue Holland, MI 49423). In lieu of flowers, the family asks that donations be made to Camp Geneva (3995 Lakeshore Drive North, Holland, MI 49424).